City Creek Center celebrated its one-year anniversary this past week, so I thought I’d mark the occasion by putting aside my general distaste for the place and go there to dine. My lack of fondness for City Creek is already on record: I find it cold, clammy and commercial, a place that lacks soul. Like many City Weekly readers, I tend to favor independent, local businesses, and those are few and far between at City Creek. As for the dining options, let’s just say that interesting and ethnic fare isn’t really an option, unless you choose to dine at one of the handful of worthy food-court eateries such as Bocata Artisan Sandwiches, Taste of Red Iguana or Mykonos, or maybe Utah-based Blue Lemon. A place serving Brazilian-style fare—like Dallas-based Texas de Brazil—sounded like just the sort of spot that might begin to turn my thinking about City Creek. After all, I’m a sucker for churrasco. We’ve been over this before, but to recap: Churrasco refers in Portuguese and Spanish to grilled meats, the type that are popular in cattle-producing regions of countries like Brazil, Argentina, Bolivia, Chile and others. A churrascaria is a restaurant that serves those grilled meats, typically in all-you-can-eat fashion, called rodizio in Brazil, where this style of eating is most popular. That’s what Texas de Brazil is: a churrascaria. It joins Salt Lake City’s other churrascarias—Braza Grill, Rodizio Grill and Tucanos Brazilian Grill—in serving churrasco rodizio, where servers rotate from table to table serving a selection of grilled meats from skewers until you say “Uncle!” One thing that sets these churrascarias apart from their Brazilian brethren is the pricing. American churrascarias tend to be opulent, normally with a vast array of both hot and cold buffet items, rambling salad bars and numerous cuts of meat. That’s in contrast to the ones I visited during my time in Brazil, where the churrascarias are more about cheap eats; think Chuck-a-Rama versus the Grand America Sunday brunch buffet. Of the SLC churrascarias, Texas de Brazil is the priciest, at $42.99 per person for a full dinner. Braza Grill charges $19.99, Rodizio is $25.99, and Tucanos charges $20.95. Beverages and desserts are extra at all of these. From the exterior, the entrance to Texas de Brazil looks like you’re walking into an under-the-radar speakeasy. There’s nothing to prepare you for what’s inside, which is a large, sprawling, beautifully designed restaurant space. You’ll immediately understand where a healthy chunk of the $42.99 full dinner price goes: toward the lavish décor. Backlighting seems to be a favorite technique of the Texas de Brazil design team; the bar on the left as you enter the restaurant is backlit, as are many features of the restaurant, like glass walls, pottery displays and wine cabinets. Dark wood floors and a mix of rich, rustic colors lend a warm feel to the restaurant, which is otherwise very modern. It’s beautiful. A server arrived to give us the Texas de Brazil rap: Each diner is given a green- yellow-red marker, which signals to the meat-slinging servers your current consumption status: green means “bring it on,” yellow is for “I’m taking a breather,” and red means “I surrender!” Texas de Brazil has a better wine list than I’ve seen in any other churrascaria, and I was curious about the house wines: those bottled specifically for Texas de Brazil. I asked our server if he knew who made those wines, at which time he disappeared, never to be seen or heard from again. Odd. Thankfully, after a somewhat confusing wait, we were rescued by an excellent server named Grant. Turns out he’d been trained by Gastronomy Inc. while working in the group’s restaurants here. From then on, service was absolutely excellent, and Grant was knowledgeable not only about the food, but about the extensive wine list. The guys serving the skewered churrasco were all from Brazil, and also top-notch servers and very friendly, even tolerating my rusty Portuguese. As far as the food, the buffets are similar to the other churrascarias in town. There are mandatory dishes like Brazilian hearts-of-palm salad, feijoada, rice, black beans, etc., along with a few unusual touches such as fresh buffalo mozzarella, grilled portobello mushrooms, shrimp salad, imported charcuterie and delicious steamed asparagus with strawberry sauce. If you’re interested in just the salad bar and buffet, the price for dinner without meats is $24.99. Also, each table is given a gratis serving of pÃ£o de queijo (Brazilian cheese bread) and sweet fried bananas as starters. 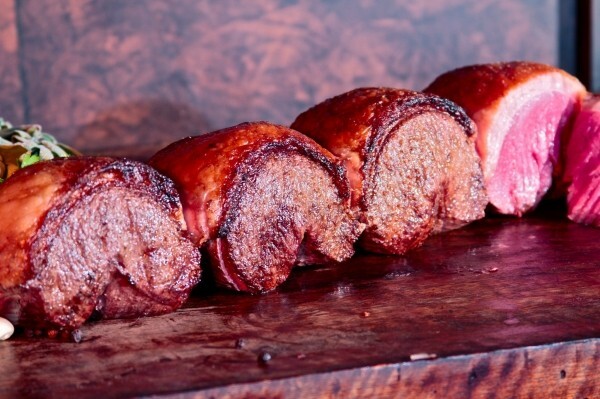 Although the Texas de Brazil website mentions 14 cuts of meat, the same five or six kinds kept rotating to our table. There definitely weren’t 14. The bacon-wrapped filet mignon was meh, as was the Parmesan chicken. But I felt that most of the cuts we tasted were a notch in quality above other local churrascarias. Flank steak was tender and juicy, and I always love linguiÃ§a (Brazilian sausage). But the one cut we couldn’t say no to, over and over, was picanha, the prime portion of the beef sirloin. The pata de cordeiro (leg of lamb) was also excellent. I do wish they offered the skewered chicken hearts that are a staple at many other churrascarias. Ditto grilled pineapple, which is missing at Texas de Brazil. All in all, I think Texas de Brazil is a perfect fit for City Creek Center.